Greenhouse gas concentrations spike — heating the atmosphere and the deep ocean after a period of glaciation during which vast stores of carbon accumulated. Massive volumes of this carbon lay dormant — trapped in frozen ground and in clathrates on the sea bed. As the ocean and airs warm, these carbon stores release causing a massive spike of additional greenhouse gasses to hit the atmosphere and setting off ever-more-rampant heating. The cycle continues until much of these carbon stores out-gas, pushing the Earth into a hothouse state. What I’ve just described is the process that most scientists believe occurred during the worst mass extinction event in the geological past — the Permian Extinction. A hothouse event that killed 95% of life in the oceans and 70% of life on land. And what humans are now doing to the Earth’s airs and waters through CO2 and related greenhouse gas emissions may well be shockingly similar. From the Arctic tundra to the Arctic Ocean sea bed to the Atlantic Ocean, we have growing evidence of methane and CO2 releases from carbon stores that may well be at the start of just such a large scale feedback. Time and time again, we see evidence of significant (but not yet catastrophic) emissions from Arctic methane stores (see image above). With each passing year, the methane overburden in the Arctic air grows. And we have had increasing evidence of a growing volume of releases from the East Siberian Arctic Shelf sea bed, to the methane emitting melt lakes proliferating over the thawing permafrost, to the chilling and terrifying methane blow holes discovered this year in Siberia. As of 2011, many Arctic scientists believed that human-caused heating could set off methane and CO2 emissions from that region equivalent to between 10 and 35 percent or more of current human fossil fuel burning by the end of this century. The lower boundary of this range is with rapid reductions in human greenhouse gas emissions, the upper boundary is under business as usual. Such a 35 percent equivalent emission, happening year on year for centuries, would be more than enough to push Earth into a runaway hothouse scenario without any further human greenhouse gas releases. And it is this scenario, or the even more chilling worse case of very rapidly ramping Arctic methane outbursts, that we should be very concerned about. Unfortunately, the vast carbon store in the Arctic is not the only potential source of heating feedback carbon release. For around the world, upon and beneath the ocean sea bed, billions of tons of methane lay stored in clathrate structures. These stores are separate from the large carbon deposits in the Arctic. But they are no less dangerous. In 2012, Nature issued a study that found a store of clathrates composing billions of tons of methane was now destabilizing off the US East Coast. The study predicted large-scale releases in the multi-gigaton range from the southern region of the East Coast methane clathrate store due both to changes in the Gulf Stream circulation and to warming bottom waters — both impacts set off by human-caused climate change. The study was uncertain how fast such a release could occur, but noted that the eventual release was likely due to wide-scale clathrate degradation associated with ocean bottom warming. This year, research vessels returned to the region and found 570 plumes of methane venting from destabilized clathrate stores there. This result was surprising due to the fact that only three methane seep sources had previously been identified. The plumes were discovered in 50 to 1,500 meters of water, with most of the seeps occurring at between 250 and 600 meters depth, along a zone stretching from Cape Hatteras to Georges Bank. The seeps ranged in age from recent to 100 or even 1000 or more years old. Overall, the prevalence of seeps was more widespread than expected. Currently, only a small amount of the methane being released from the sea bed off the US East Coast is likely hitting the atmosphere and is probably not contributing anywhere near the volume of known emission sources from the East Siberian Arctic Shelf. Most of the gas is just absorbed by the water column, increasing acidification in the region and contributing to anoxia. But the known clathrate store off the US East Coast is very significant and large scale releases could result in much more widespread anoxia, acidification, and provide a substantial atmospheric heating feedback to human-caused warming. Very large and catastrophic outbursts could also result in slope collapse and generate tsunamis along the US East Coast. A concern that researchers may also need to further investigate. Overall, as much as 300 to 400 gigatons of methane could be at risk and even a fraction of this store hitting the atmosphere would cause serious and lasting harm. Overall, it is estimated that at least 30,000 methane seeps like the ones recently discovered off the US East Coast may now be active with potentially 10,000 in the East Coast region now under investigation. The current study provides a good base line for further exploration of what may well be a rather significant problem going forward. The acceleration would indeed have to be substantial to add to the already significant and troubling Arctic methane and CO2 release. But the sea bed stores are vast and the rate of human warming is very rapid. So the global ocean clathrate store is something to keep under close watch and the discovery of yet one more source that is already emitting at faster than expected rates is not at all comforting. I’ve seen that one. Would put it near absolute worst case. Not seeing it now and hope not to in the near future. I do like Sam’s policy statement from July and hope to blog about it soon. Dr. Kent Moors writes: During the height of the Deepwater Horizon tragedy four years ago, I had my graduate students monitor the flow of oil from the sunken platform in the Gulf of Mexico. Most of their work involved rather straightforward calculations based on undersea camera footage. With that, I walked over, checked some figures, and immediately called the U.S. Coast Guard contingent that was overseeing the data from the disaster. Fast forward to today, and there have been some equally disquieting discoveries in the news of late. So what do mysterious holes in the Siberian permafrost, hundreds of gas plumes off the East Coast, and our “ghosts” apparently have in common? And there is another disquieting revelation. 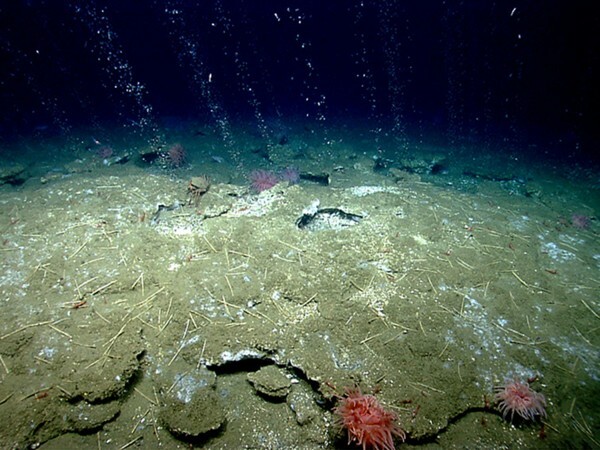 Methane hydrates can become unstable… and explode. That seems to be what happened in Siberia. That brings me back to my student’s observation in 2010. Because the “ghosts” he was watching were dissolving hydrate chains floating up from the seabed in the immediate region surrounding the wellhead. I still think this was the primary cause of the Deepwater Horizon tragedy. So how much energy are we talking about? The U.S. Geological Survey estimates that gas hydrates could contain between 10,000 trillion cubic feet to more than 100,000 trillion cubic feet of natural gas. When brought to the surface, one cubic foot of gas hydrate releases 164 cubic feet of natural gas. The figures I saw were 1 trillion to 10 trillion tons of carbon if it’s all burned and hits the atmosphere. If we burn that crap, we might get to Venus after all. Of course there are a bunch of dumb-asses dancing around with dollar signs over their eyes right now just thinking about it. And some idiots are already claiming that burning it is a mitigation. Thanks for this. I had seen speculation that the Horizon had hit a clathrate pocket. Good to see some hard research on it. Very bad idea for a fuel source. Climate change game over and then some. Trapped in the spam . Sorry Bob, the last post was 20-30 percent misinformation and needs a good fact check. That’s OK , but we are killing 93 elephants a day . And 1 million people born every 4½ days. Yeah, that’s rough stuff. I’ve gotten rather annoyed with the anti renewables propaganda of late, though, which often seems to be imbedded in statements that are otherwise true. Robert, Haven’t had much time to post recently. What are your thoughts on the Atlantic having a major role as the heat sink in relation to the slowdown in surface warming? It makes sense to me when I think of the southern ocean (and its associated currents) but it would seem that maybe the pacific and atlantic are in sync in some way. This would make sense in terms of the pattern of surface warming over the last 150 years showing “steps”. Read the reports of where the heat is flowing, in the Atlantic , then watch where the methane is out gassing. I think of the southern ocean (and its associated currents) but it would seem that maybe the pacific and atlantic are in sync in some way. Nothing could be farther from the truth They all are doing their own things. There is a brine current falling into the bottom of the South Atlantic that is really powerful . But it pales compared to the surface current entering the Drake Passage. This is most powerful ocean current on this Earth. And it’s getting nastier. The sea birds in Iceland are dying, because the oceans are changing. North and South. Every living thing is under this pressure now. even if we don’t see it. Under standard ocean circulation, yes there’s a brine current. Just as under standard ocean circulation the Gulf Stream doesn’t back up. But we’re not dealing with standard ocean circulation or hyaline concentration. The southern ocean near the pole is freshening. And the southern ocean nearer the equator is getting saltier. We have increased evaporation at the equator due to both warming and increased wind speed increasing the volume of warmer air. So the salt content at the lower latitudes increases, making the water denser. The warm water currents move north and south, carrying the saltier water. In some regions, they don’t spread too far, and so the warm water dives to the depths closer to the equator. In other regions, they reach about 60 degrees or 65 degrees or even 70 degrees latitude and there they encounter a fresher layer than before (due to enhanced melt). The fresher water further north and south helps to create a differential wedge in which the saltier water is driven below surface, adding to the dynamic in which salty, denser water sinks. This is the fresh water wedge effect. Now in the Atlantic we’ve had a high level of salt water formation due to the equatorial driver associated with AMO which appears to have been enhanced by warming. We also have enhanced fresh water formation near 90 N and toward the Beaufort, in the ESS, in the CAA and in the near coastal areas surrounding Greenland. These zones generate wedge/bottom water formation enhancement zones. In the south Atlantic, you have a similar process where saltiness is enhanced by global warming related evaporation and a far more powerful set of circumpolar winds in the zone. The saltier water encounters the fresh water wedge expanding out and generates more powerful bottom water formation (60 to 65 south). In the Pacific, negative PDO enhances bottom water formation at the equator, as have the stronger trades blowing in that region. Ocean current transport on the Pacific is such that much of the heat pools beneath Antarctica, resulting in enhanced basal melt, which drives the fresh water wedge in that zone. That’s the dynamic interaction which appears to be ongoing. Eventually, the flood of fresh water in various regions will be strong enough to shut down deep water formation (rain, slowing of trades at the equator, the flooding of the salt water column in the north and south Atlantic). When this happens, you have a final cool spike due to the peak extent of fresh water. Then, bottom water formation shut down eventually results in more heat backing up into the atmosphere. And that is the AMO/PDO/warming interplay that I’ve been able to gleam from these various reports. You’ll have to accept that this is meta analysis and that the science has not set up any explicit link between all the various parts as yet. You have the AMO driver camp and the PDO driver camp and the various research that appears to contain conflicting information about fresh and salt water formation (until you look at exactly where the fresh and salt water is forming and at how fresh water generates a differential wedge as it advances). One last point and I’m done — despite the powerful deep water formation in the North Atlantic during negative AMO, we’ve still seen strong warming in that region, implying that deep water formation there has not been enough to over-ride other warming factors in the Arctic zone. In the Pacific, with negative PDO, we saw some surface cooling, especially in the eastern Pacific with the more prevalent La Niña phase (tropical cold water upwelling with hot water down welling in the Western Pacific). And in the Southern Ocean, we have seen a strong degree of cooling coincident with both a thickening fresh water wedge, zones of enhanced bottom water formation due to variability and warming factors, and coincident with a greatly enhanced storm track. If you look at the temp anomaly graphs the southern ocean is a huge heat sink over the past decade. In addition, we see a strong correlation with negative PDO and warming hiatus years. My opinion is that the two are almost certainly related. And it probably has something to do with the way that sinking heat in the pacific transfers to upwelling beneath the south polar zone and adjacent to the South Atlantic. You would have basal melt of the ice and fresher surface water which would shut down the ocean to atmosphere heat transfer, and aid in the process of generating the heat sink through the salt water/fresh water differential and the fresh water wedge effect. I built a very large solar oven once, an several other solar projects. When Robert Callaghan tells you that the Ivanpah solar plant in the Mojave desert is frying birds in mid air it is . One does not stick ones hands into these beams. Because they melt zinc pennies in seconds. And zinc has the lowest melting point of any metal, bats and birds burn several hundred degrees lower. Well, yes, but the number of bird kills is almost certainly over stated in that report. In any case, net bird kills from solar is 1/100th that of coal. I have three reports on this CSP plant. One shows kills in the range of a thousand or so per year. One shows kills in the range of a few thousand to five thousand per year. And the one referenced shows 20K per year. The conservative estimate is industry based (so it would be low) and the high estimate is based on a report by an agency that’s been going around bashing wind and solar for bird kills. I am more inclined to believe the middle estimate. In any case, FF and especially coal, results in far more bird kills, even when you don’t include the long term impacts of climate change, which just wipes out most everything. Yes, house cats wreak havoc on suburban bird populations but most folks are completely ignorant of just how much. Thanks for clarifying the point I was trying to make with the skit, I am sure that some folks didn’t get my gallows humor. In any case, your garden variety rooftop solar panel has even less impact where birds are concerned. But the effort behind publicizing this report aims directly at all solar. So, yeah, gallows humor aside, it’s pretty easy to smell the fossil fuel bucks. The Huffpo article that originally advanced the story even included an end caveat saying that all energy sources were needed, implying a need for continued reliance on fossil fuels. In any case, the storm track appears to be firing up again for the UK. Nothing too strong at the moment. 990 mb low. Would have to watch rainfall totals for almost anything these days. 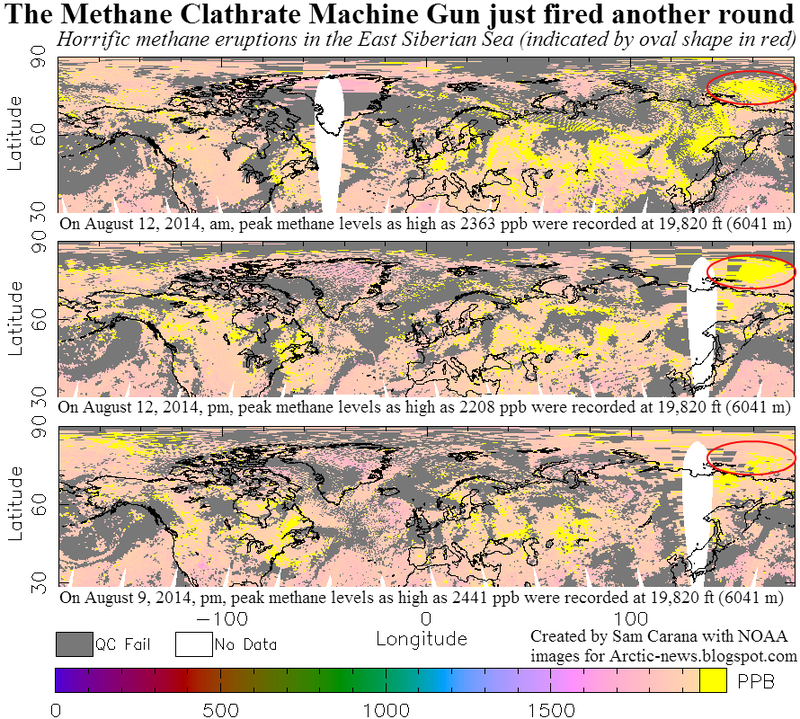 Finding an increase in methane plumes in an area not in the Arctic – ie where we assumed the methane would the stable long term – is really rather bad news. It would seem to suggest the probability of an end Permian outcome is actually much higher if other regions are also starting to destabilise. Given the rather low probability that humanity can avoid all this now, surely it’s time people acted more directly and more realistically to cater to dealing with these outcomes? Campaigning for emission reductions and renewable energy is well and good – but it’s increasingly clear our species is going to face a battle merely to survive in any numbers, never mind the billions of today. We need solutions and people ambitious and insane enough to stand up to those demands, and I don’t generally see this around me – or in the wider world. And one year ago, when the book published this was seen as very ambitious and probably too alarmist. It’s worth noting that the US currently only has a 30 percent emissions reduction goal. So the zero from generation by 2050 would be an extraordinary improvement. But Pin is right to imply we should probably be moving faster. I’m more in line with emergency reductions of 80 percent by around 2020, at this point. Sam is probably right in this respect and I need to be writing another book. Thought all you data freaks 😉 might find this interesting. We are all in hospice. Everyday is real treasure, & there won’t be too many of them. This methane release ramp-up is not good. How long before it goes hockey-stick? Will reblog this article and Sam Caranas’ graphic on “Fin des Voies Rapides (If Peak Oil Were No Object)” this afternoon. Thank you. NOT TOO LONG – probably before 2020! We will probably need rapid mitigation with other mitigation measures added. We can’t keep burning until fuel access levels naturally peak. Besides, the peak level is, to a degree, pushed by extraction technology. They are working on means to extract clathrate. The size of the source is in the range of trillions of tons. You get extraction tech for that and you can say goodbye to peak fossil energy and hello to climate change game over lock down. Trillions of tons. A trillion is a thousand billion. That means we are looking at up to 10,000 gigatons of carbon. And the amount of gigatons of carbon in the atmosphere now is only several hundred! May the clathrate extraction technology turn out not to be financially feasible. Go over to the Archdruid Report, and he’ll tell you that the present tracking mania is a bubble, it’s not profitable (at least for gas it isn’t), and that the bubble is about to collapse, pulling the rug out from underneath FF investments. I hope so. They did extend themselves financially in order to rapidly expand fracking and the profits are certainly no-where near what old fossil fuel profits looked like. But the support for these projects is massive and there do appear to be some survivors of any consolidation/shake-down that may be oncoming. I would not rely on market forces to save us from fossil fuel extraction. Usually, once the up front costs are handled, someone manages to keep squeezing the stuff out for years and years and years. My primary hope is for a combination of anti-fossil fuel sentiment due to climate change and a shift to renewables to stall enthusiasm for fossil fuel investment. In general, I currently believe that policy support is needed to break log-jams that will inevitably arise due to the vested political power of fossil fuel industry and traditionally related utilities. I hate i-phone auto correct! Me too. Gets me all the time. In particular, Shakhova notes the first direct evidence supporting her theory of thawing pathways that belie the millennial time-frame of the outdated “slab” model of sub-sea permafrost thawing. I don’t imagine myself to be well-informed, but I believe this is a rather new outlook — popular theories that I’ve seen on Youtube put the CO2-warming precursor for the Permian methane-warming phase in the 5-6C range. Michael Benton is the author of the 2005 book “When Life Nearly Died” which explores the theories and evidence surrounding the End Permian extinction. He is anything but a table pounding advocate of one theory over another, preferring to understate and slowly develop understanding of how scientific perception of the event has grown and changed. Mr. Breeze will be doing an interview with Dr. Shakhova in September or October upon her return from her present expedition (SWERUS-C3), which has been covered in this blog. Thanks, Bill. I need to do a write up of Shakhova’s recent statements RE sea-bed methane. RE the Permian… it appears to have happened in phases. My personal opinion is that emergence from glaciation is the relevant driver as glaciation is a carbon sequestration mechanism. So whatever temperature is enough to take down the ice is probably enough to start releasing the carbon. We had a jump of 100 ppm CO2 and 200 to 500 ppb methane at the end of the last ice age. What surprises me is how little research has gone into more specifically identifying where that carbon came from. It’s possible Beckwith is mistaken regarding the capture of a short-term methane eruption within the ice record, but that is irrelevant, since one would not expect a major methane release without first having a greenhouse phase — which is not evidenced in the ice record. As Beckwith notes, you have to go back much farther (2 to 3 million years) to find CO2 levels like we have now. The rest of Beckwith’s argument is compelling and has not been refuted. But regardless what the paleo record may be saying, the proof is in the pudding, and Shakhova is doing the real work where it counts. “Clathrate releases in the Arctic sea floor cannot be related to anthropogenic global warming because the anthropogenic warming signal has not substantially propagated to the sea floor, never mind to the deep-under-the-mud layers where the clathrate would destabilize. The releases that Shakova et al have measured are presumably related to pressure changes at the sea floor due to ongoing natural isostatic rebound since the glacial peak 20,000 years ago. I’m still working on transcribing parts 2 and 3 of the Shakhova interview, but if you would like what I have so far, email me. (May save you some time since a lot of it is difficult to make out). You have to expand the comments a few times to get to his comment. No. What I’m saying is that glaciation provides a large feedback carbon store, whatever the warming driver. In this case human carbon emissions are clearly in the driver’s seat. But, in the past, orbital changes pushed carbon cycle feedbacks. I think it’s more than worthwhile taking a closer look at how this happened as it may give us a sense of what Arctic stores are bound to release, how swiftly they might release, and how sensitive they are to forcing. In general, I don’t understand how someone could possibly think I believe that orbital changes are dominant. The primary focus of this bog has been to track the current human warming effects. So the assumption is not appreciated. Xiaoli Liu and Dr. Peter Flemmings have studied high salt methane hydrates at Hydrate Ridge, off the Oregon coast. They claim that salt allows the methane hydrate deposits to be at the “triple point” of the system making the system much more temperature sensitive than low salt deposits. The Yamal Peninsula is high in salt – several available scientific papers confirm this. Sixteen miles from the Yamal crater lies the giant Bovanenkovo gas field, containing about half as much methane as currently exists in the atmosphere. The roof of this deposit lies at about 600 meters depth – so it might or might not be safe from gas eruptions originating at about 100 meters depth. Salt does make methane more mobile, and allows gas phase transport of methane within the deposit. Also, there seems to be a regional layer of methane hydrate, encountered when drilling at multiple gas fields, at about 100 meters in depth. So, there could be many more of these methane blowout craters to come, and the high salt areas could be the first to blow. It may be that the terrestrial hydrates cannot be at the triple point of the methane hydrate system. The original Yamal crater and the two other craters, though, argue that this is not the case. The regional layer of methane hydrate and the gas that will likely start to erupt from that layer might be a problem. A bigger problem, though, is if the Yamal blowouts happen to blow out a drill rig and a working gas well- or several of them. That could open up the deeper areas of the Bovanenkovo,field, for example, to the atmosphere, and create a way that the huge amounts of gas in these giant gas fields could escape. The total amount of methane in the Siberian gas fields is several times the amount of methane in the atmosphere of the earth-more than 25 trillion cubic meters of methane. Realistically, it seems unlikely that the Yamal blowout craters would damage a gas well beyond repair.But the consequences if this does occur, and if it occurs several times, could be huge. Given an international effort,it might be possible to remediate the gas fields that are in high salt areas in Siberia, and even do it in an almost carbon neutral way. The natural gas could be burned in oxygen to generate electricity, and create a stream of CO2 and water vapor, and that stream could be deep injected several kilometers into the earth. This is off the shelf technology, and could be done easily. The giant Siberian gas fields could become a huge source of electricity, and this electricity could be exported to Europe The layer of methane hydrate at about 100 meters depth could be drilled into, and the pressure from this layer released, preventing a Yamal type blowout. But, if the Russians try to cover up this problem, it’s going to be harder to remediate it, I think. I’m told that 100 meters in depth is out of the methane hydrate stability zone – unless that area is under an ice sheet, and the additional pressure from the glacier allows the hydrate to form. So, there may indeed be a regional Northwestern Siberia hydrate layer, confined to areas that were recently glaciated. I think that this high salt idea is a consistent hypothesis, and it seems to be starting to make good predictions. These cold gas eruptions should be confined to areas high in salt, that were recently glaciated. Unfortunately, large areas of Northwestern Siberia may fit those requirements. What happens if a volume of high salt triple point hydrate at the dissociation boundary experiences a sudden loss of pressure? I think that a wave of dissociation from hydrate to gas propagates through the deposit – like a bottle of champagne after the cork is popped, like Anna Kurchatova said.